Even though it's getting a bit long in the tooth (in digital camera terms) for many people the Panasonic LX3 is still the perfect compact camera. It fills a niche all of it's own - fitting in somewhere between the mass market compacts and the Micro 4/3 semi-pro models. It could be argued that it's wide fast optics are still unmatched at this price point. That's not to say it isn't without it's negatives - a limited zoom and a manual lens cap are the most common complaints. Lens caps are an accepted norm for SLRs but have become anachronistic for a camera of this size. Many LX3 owners, like myself, have upgraded from a compact camera with a built in automatic lens shield and therefore find the need to frequently remove and replace a lens cap to be an irritating inconvenience. For a while now, many people have worked on creating alternative solutions based around the Ricoh LC-1 lens cap. This cap is designed to be permanently attached to certain Ricoh cameras and the iris of hinged doors automatically open whenever the lens is extended. The process of modifing the LC-1 lens cap to fit the LX3 was less than simple with various fiddly techniques being used to file the lens down and cut out some plastic. Most of these techniques run the danger of stripping the plastic lens cap threads on the LX3. I bought an LC-1 lens cap and attempted this mod - I ended up slashing my finger so badly with a stanley knife that I had to superglue the cut together to stop it bleeding and unsurprisingly the project went on hold. Well imagine my relief when I found a HK retailer on Ebay selling a 'copy' of the LC-1 lens cap design, purpose-built to fit on the LX3 straight out of the box. The lens cap is called the JJC ALC-3 and cost me £11 delivered (search ebay for auto lens cap lx3 to find a retailer. So now that it's arrived, let's see if it works. First thing to do is unscrew the lens screw thread cover from the camera. If you decide to do this yourself, make sure you look after this component, this seemingly insignificant ring is notoriously difficult and expensive to buy. The next step is to screw on the new lens cap and wave farewell to the old one. The main (only?) difference between the original Ricoh and the JJC cap is that the latter has the correct size of thread to enable it to screw onto the LX3 mount. It turns out that this is all that was needed to make the lens work perfectly with the Lx3. The lens cap screws on effortlessly and fits snuggly and securely. I don't think it looks too ugly and most importantly for me, the camera still fits in it's official and expensive custom leather case. The opening and closing mechanism works well once it's on the camera and the doors don't infringe upon the lens - even at maximum zoom (the LX3 lens gets shorter as it zooms in). [EDIT - unfortunately it does vignette - check comments for more info]. The doors are a bit flimsy, but no more so than the original Ricoh model, but I'll be buying a spare one, just in case. I should also mention that the cap isn't air tight, so dust could still sneak in through the cracks between the doors. UPDATE 20th February 2010 - Erik commented that JJC are apparently looking into modifying the Lens cap as a result of customer feedback. The two problems with the current design are Vignetting when zoomed in and weak springs on the flaps - JJC emailed the following reply to Erik.... "We had customer reported similar feedbacks to us before. Therefore, our factory is trying to improve the auto lens cap’s quality … Please wait for our second generation ALC-3 and we will improve those weak points to make you satisfaction!”. Excellent news - maybe we will eventually get the lens cap that all LX3 owners are waiting for. Please watch my follow up video on how to quickly and cheaply mod this lens cap so that it doesn't vignette at maximum zoom. Now I'm finally satisfied with my LX3. 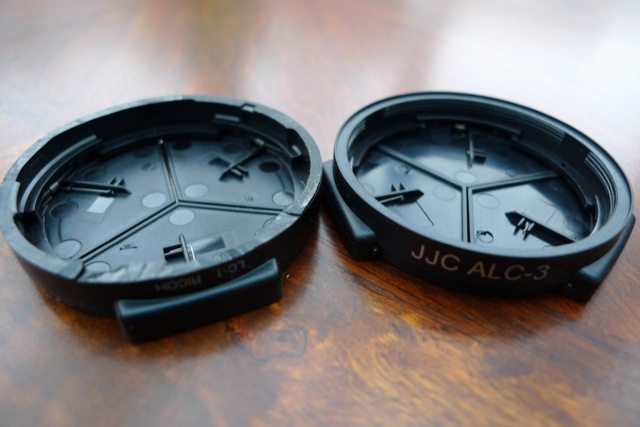 Be sure to check out my report on JJC's version 2 update of their ALC-3 LX3 lens cap. 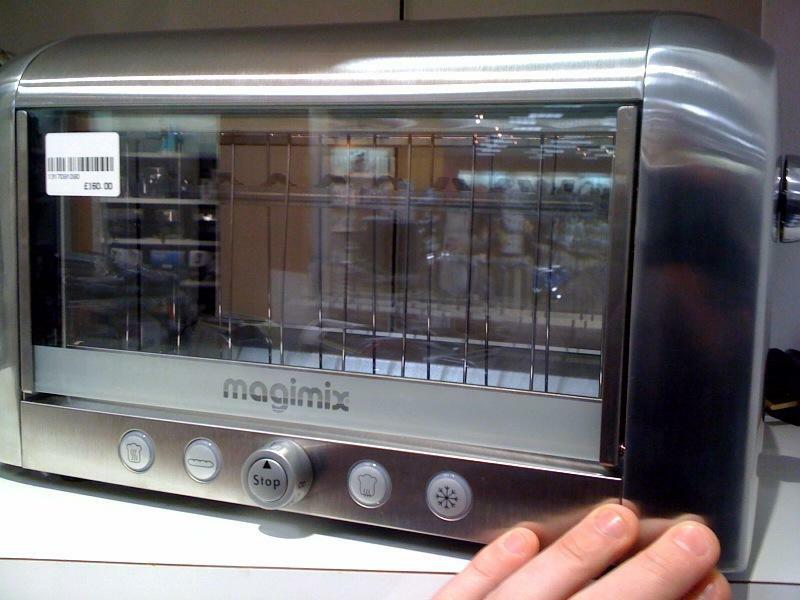 I got to have a good look at the Magimix Vision clear glass sided Toaster today in Kendals (House of Fraser) in Manchester. Previously I’d only seen renders in a nice video. In person (?) it’s a nice machine and I was glad to see that the glass sides fold down for easy cleaning of the interior. Obviously I didn’t get to test it – Kendals staff might have objected if I’d pulled a couple of slices of bread out of my pocket. Instead they left me alone long enough for me to take a few pictures with my iPhone shown below. Now the sticker shock – for those who don’t know Magimix, they are a prestige kitchen equipment manufacturer and already sell a number of Toasters costing £100 plus. Since the Vision is the new top model in their range, the price reflects this and it’s £160. Yes that’s £160 just to make toast, strangely enough I’m still tempted to buy one. I have a bit of a history with novelty toasters – my current model is an old youtube hit with over 100,000 views of my video entitled “My Incredibly Cool Toaster”. The Magimix model might not be as interesting to watch as that one, but it would ensure I burnt my toast less frequently. Streaming video around the house without a video sender. I haven't updated the blog for ages because of two reasons. In 2009 I used up all my tech-buying budget on a new Conservatory and Garage. I seem to spend all my time either at work or sleeping. So now that it's the Christmas break and I've finally found a bit of spare time, I've put another video together. This video is an explanation and demonstration of my wildly overcomplicated solution to a common problem, that is - how to get TV from one room to another without sending it down a wire. I already pay for Sky Multiroom and this means I can have Sky TV in two rooms, the Lounge and the master bedroom. Now that I've bought a third TV for another room I also wanted the option to watch Sky on this- the only caveat is that there can be no wires between this TV and either of the existing Sky boxes. Watch the video to see how I went about achieving this seemingly simple task (without using a traditional video sender). A quick post - here is a gallery of pictures of various forms of transport I took on my European Cruise. People in France and Italy seem to have a liberated approach to transport that makes the UK look dull in comparison (not difficult). Their use of scooters is particularly interesting to me. 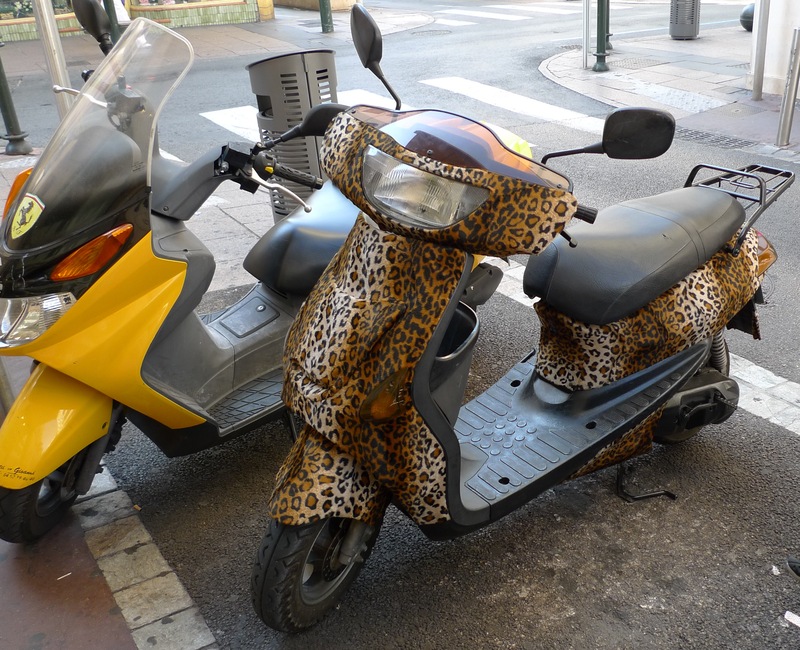 I saw two teenage sons dropping their mother and sister pillion passengers off in town for some shopping, a young mother holding a baby in her arms whilst her husband weaved their scooter through rush hour traffic. Numerous toddlers standing up behind scooter windshields holding onto the handlebars above their head. People carrying all shorts of things in one hand (pizza, laptop etc) whilst using the other hand to accelerate, steer and brake. A common practice is to jam a mobile phone down the side of an open face helmet - a kind of rudimentary hands-free. It looks like a free for all - but imagine what would happen if all these people were forced to drive cars instead - gridlock. Better to let things work themselves out organically. Vehicles here aren't cherished prized objects - most of them are battered and dented. People park up against one another and no one seems to mind. A near-miss I saw was greeted with an apologetic wave from the offender and a never-mind shrug from the driver who nearly T-boned them. A lot different from the swearing road-rage scene that would have no doubt ensued in the UK. As far as the cars go - the supermini is king. I'm particularly fond of the original Fiat 500s - they actually make the Smart car look bloated and are still being used for everyday transport rather than kept as cherished classics. Many of the American tourists had never seen a Smart car before and were amazed at this vehicle which is already a familiar well established car in most of Europe. If anyone wants to look at the transport options for the future they need to take a long hard look at a city like Rome to realise that if you step back and let the people figure it out themselves, then they might just do that. The weather does play a big part though. I haven't posted for a few weeks as my house is undergoing a considerable amount of building work - leaving very little time to sit down and relax. Part of this building work involves the construction of a Conservatory. This is entirely the wife's idea - but it does mean that I now have the opportunity to fill another room with entertainment equipment. I'm not too sure about putting a TV in a room made of glass - so I decided it would be a good opportunity to get a nice new speaker dock for my iPhone. I would have been happy to continue using my old JBL On Stage for a while, but it doesn't work with my iPhone 3G - so I went on the hunt for a new stylish and compact speaker with excellent sound. I took my iPhone to Costco and stuck it in a number of different speaker docks to try them out. 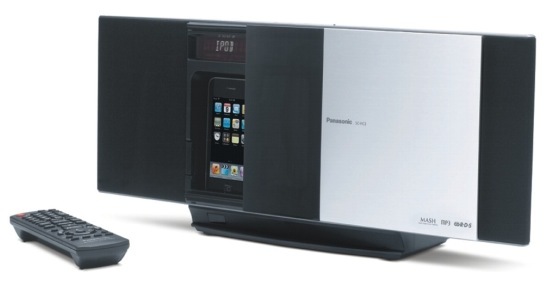 The system I came home with wasn't just a speaker, but a fully fledged bookshelf Hi-Fi system - the Panasonic SC-HC3DB. It won me (and the missus) over with its excellent sound quality and its ingenious solution for neatly storing the iPhone away whilst at the same time keeping it's display visible. As usual, I've put together a short video and I suggest you give this one a look if you are thinking of getting a new iPod/iphone speaker or a bookshelf HiFi - It really produces an amazingly detailed and rich sound which belies its modest £175 price tag. I'd have happily paid that just for a speaker this good and I had to check the shelf price twice when I saw that this included a CD and DAB/FM radio as well. A Tomtom on a Scooter - finally my solution is complete. Like anything I do with regard to technology, the simple idea of adding a Sat Nav to my scooter has got a little bit out of hand. 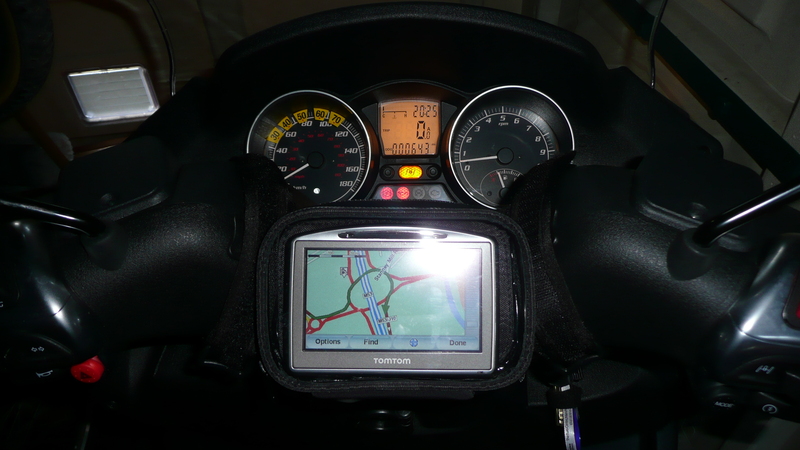 A couple of weeks ago on this blog I demonstrated the case I bought to attach my existing Car Sat Nav (a Navigo flashed as a TomTom) to my scooter. I noticed at the time that the tiny Navigo looked a little bit lost in the large case, so I started shopping around for a new Widescreen Sat Nav. I also decided that my new device should have the ability to somehow wirelessly transmit it's voice instructions to a receiver in my helmet and as usual I wanted to spend as little money as possible. In the end I settled on a TomTom 520. Other than my familiarity with the TomTom OS the main reason for choosing this model was that it was the cheapest device I could find that could transmit its sound output over FM to a radio receiver. My intention with this was to keep a small FM radio in my jacket pocket and wear in-the-ear headphones inside my helmet. So I tried this out, and it was working fine - albeit with some interference - until I did a firmware update on the TomTom - at which point it then stopped working. Apparently TomTom had to remove the 'transmit voice instructions to FM' feature because it's illegal in a number of European countries. By some strange quirk - it is still legal to transmit the voice as long as the TomTom is playing music at the same time!? The work-around then is a simple matter of playing a looped silent MP3 continuously in the background. 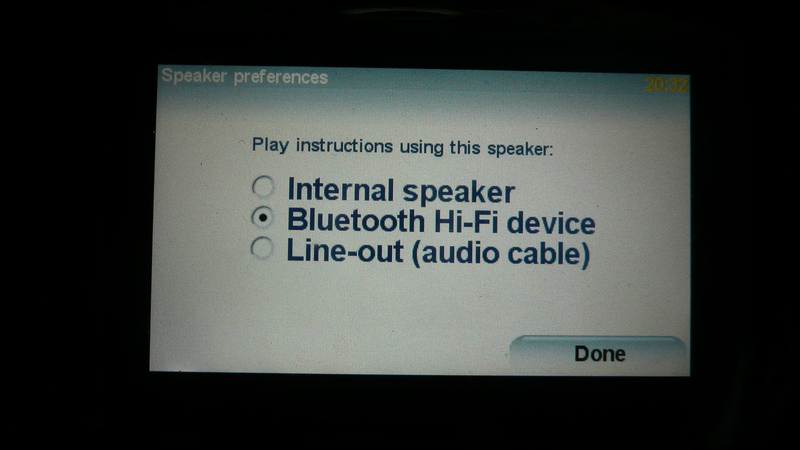 However - and perhaps as a concession to disgruntled owners, the new firmware also added the ability to transmit the voice to a 'Bluetooth HiFi Device' - presumably a car stereo. So I set about finding a suitable receiver for this function. 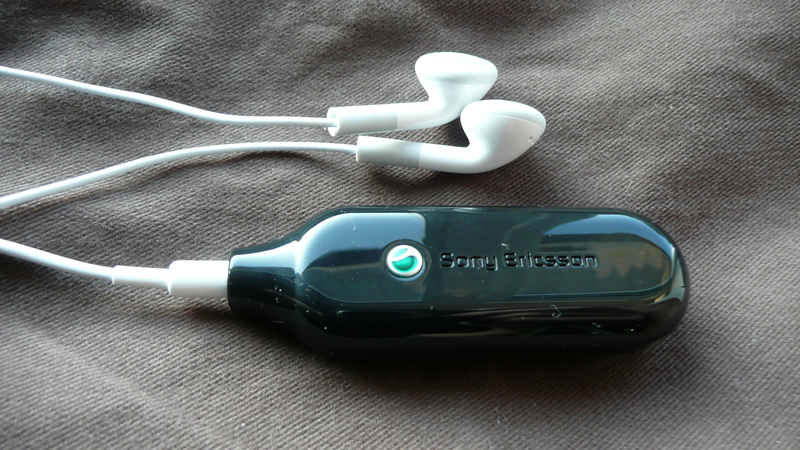 I came up with the Sony Ericsson MBR-100 The MBR-100 is a tiny rechargeable A2DP receiver/transmitter. It has one button (on/off/connect) and a 3.5mm phono socket. Paired with a suitable device it can either transmit or receive sound via bluetooth.It works perfectly with the TomTom - it picks up the sound and relays it to the headphones without any interference. So now I have bought a £40 Case, a £130 TomTom and a £30 Bluetooth Receiver. For £200 I have assembled my complete bike Sat Nav solution. I imagine that the only advantage a purpose made Bike Sat Nav would now have would be an easier to read screen. My TomTom 520 display really does wash out badly in normal daylight and this is something to bear in mind when deciding whether to pay the extra £150+ to get a purpose made motorbike sat nav. My Sony Wide Angle Lens - the VCL-HGE07TB - arrived this week and I spent my lunchtime today in Manchester trying it out. I've put together a video comparing the normal camera lens against my original Magnetic wide angle lens solution and the official Sony one. The Sony one is 0.7x and the Magnetic one is 0.45x (I think). After a few minutes of testing, the Sony solution was the obvious winner. It is definitely worth the extra cash despite the slight reduction in the width of the image compared to the magnetic lens. The lens fits well (despite it being designed for the newer model) and stays firmly attached. The lens does seem to blur the footage slightly, so its probably best to only attach it when its really needed. It will be invaluable for indoor shots in confined spaces. On my next holiday I'll probably clip it on automatically whenever I enter a building I'll be filming in - like a museum or gallery. In the video I label the footage as Normal, Magnetic Lens or Sony Lens - hopefully that's self explanatory. 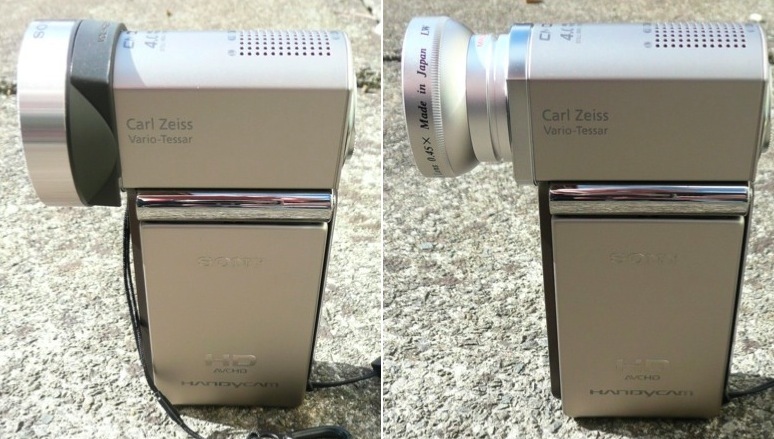 For earlier posts about the magnetic lens and the Sony TG camera click here. I've put another video review together, this time of the AEE MD80 Mini DV Spy Cam. The video explains all the details - so if you think you want a tiny video camera make sure you have a look at this first. I've got to try and make these clips smaller in future - I know that people have an attention span of a few secs - yet I still go on about nothing for minutes. The ebay seller I used for mine was inesun - a reliable Chinese exporter. You can also pick this up in Maplin in the UK. UPDATE - After a few suggestions on the Youtube comments I tried the camera again with a different memory card and I'm happy to report that it doesn't jerk any more. The card I originally used was a Lexar card supplied with the camera - perhaps the memory was a fake, there is a lot about. I feel that I didn't give the camera a fair review, so I have added a new clip taken with the new memory card in it. The card I used in the end was a 2gb Sandisk, it's not SDHC just SD (micro) and I imagine it will be a class 1 or 2. Just a quick update. I bought a sat nav case holder for my bike and put a short video together showing how it works. 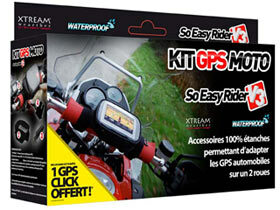 Sat Nav for bikes is ridiculously expensive, they start from £300+ whereas a similar car model is between £60-£100. The main difference between the two is that the bike one is waterproof and usually come with bluetooth to speak the directions through a wireless headset worn inside the helmet. I only want to use my Sat Nav on the bike on rare occasions - so I'm happy attaching it to the bike by using a waterproof case and either using a wired headset, or more likely forgetting the headset and just using it for visual cues. There are only two (AFAIK) bike sat nav holders in the market - the best selling Givi S850 and the newcomer the So Easy Rider V3. I chose the latter because it looked smaller, was slightly cheaper, available now (S850 is often on back-order) and claimed it would fit any bike or scooter. I can't compare the two personally - but I can confirm that the model I bought does work as promised and is therefore recommended. Slightly off topic but I'll be interested to see how TomTom implement their GPS maps on the iPhone. Bear in mind that the iPhone does bluetooth out of the box. If Tomtom could get it to understand spoken instructions (it's impossible to operate that screen with gloves on) coupled with a waterproof case it would kill the existing Bike sat nav market over night - or maybe force it to charge more realistic prices. I recently bought a new BBQ - the Kingsford O-Grill 3000. It cost me £130 online. 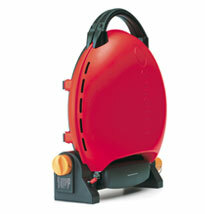 Its a portable (or transportable) Gas Barbeque that runs off normal Patio Gas. 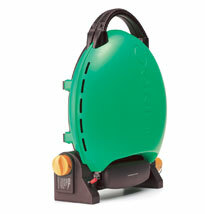 Rival portable Gas BBQs often run on expensive and difficult to find specialised canisters. Since I'll only be transporting this BBQ between my garden and the shed - I don't mind the need to use bigger gas cylinders. If you did want to carry this BBQ in a car then a 5KG gas cylinder is pretty easy to lug about too. 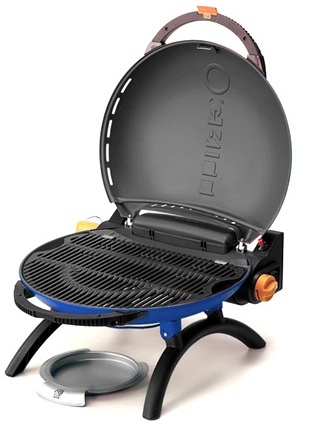 The Grill is available in a range of colours and comes with everything you need to get up and running in minutes (excluding the gas). Excellent news just in from Cos a good friend of the site. He has confirmed that Sony's new official clip on wide angle lens (the VCL-HGE07TB) does indeed fit the older TG1 / TG3 models. Cos really took a gamble ordering this for his TG3 as Sony's own website appears to indicate that this lens would only work with the new TG5 or TG7 models. It was assumed at the time that there was some slight design difference on the camera body that meant that the lens would only attach to the newer model. Cos' comments are reproduced below. Of course this now means two things. 1) I'm ordering one of these lenses as well. 2) All my previous posts about my DIY solution have now been superseded. Thank goodness I can finally forget about non-sticky sticky back rings that permanently obscure the flash and vinyetting. I should mention that the official price for the lens is £89.99 - but it looks like you get what you pay for. P.S. This may not actually be a world exclusive (I've found some more pictures on a Japanese blog)- but it's the first time its been reported in English - and with video to boot.